Evan Silva (@EvanSilva) is the Senior Football Editor for Rotoworld's NFL Page, and Josh Norris (@JoshNorris) leads Rotoworld's college football and NFL draft coverage. Together, they're breaking down every team's biggest needs and offering potential solutions in May's draft. New coach Ken Whisenhunt has had several opportunities to anoint injury-plagued Jake Locker his 2014 quarterback. He's balked every time. New backup Charlie Whitehurst is no more than a clipboard holder. There are growing indications the quarterbacks could fall in May's draft, potentially giving Whisenhunt and GM Ruston Webster an opportunity to select Teddy Bridgewater, Blake Bortles, Johnny Manziel, or David Carr with the 11th overall pick. First day option: Blake Bortles, UCF - Whisenhunt has worked with a variety of passers throughout his time as a play caller. However, he could evaluate his roster and point to the fact he already has a mobile passer (Locker) and look to move in a different direction. The Titans have invested quite a bit in their offensive line and receivers, and the coaching staff might think a quarterback can be protected and kept upright to use those weapons. Bortles flashes great pocket movement, but also displays moments of chaos on second and third reads. Second day possibility: Jimmy Garoppolo, Eastern Illinois - As astute twitter mind Thomas Gower pointed out, the Titans have only selected prospects early in the draft who have visited prior to the draft. Thus far, those quarterback names include Derek Carr and Jimmy Garoppolo. The Eastern Illinois prospect certainly has his flaws, in the form of poise, pocket movement and field vision, but teams will likely love his quick release and (reported) demeanor. Third day flier: Logan Thomas, Virginia Tech - Development is absolutely necessary. However, despite what many say, there were flashes of quality play at certain points of 2013. Thomas’ receivers dropped far too many passes which destroyed drives. His best throw might be vertical routes, and his accuracy needs to improve in the short to intermediate areas of the field. Even if it happened two years too late, the Titans finally swallowed their pride and cut Chris Johnson. Career plodder Shonn Greene is left as Tennessee's only tailback capable of handling meaningful carries. The Titans are one of the likeliest teams to use an early-round pick at running back. Whisenhunt will need a strong rushing attack to mask his seemingly inevitable passing-game woes, and his old Cardinals teams twice used top-40 draft choices on running backs. Whisenhunt will likely pursue a power back, ideally with more big-play ability than Greene. First day option: The Titans will not spend a first round pick on a running back. Second day possibility: Carlos Hyde, Ohio State - With the buzz that is out there, Hyde will likely be the first running back off the board. Yards can be blocked for backs thanks to good offensive line play, but Hyde creates space for himself by beating first contact. He became far more explosive this year, bursting through contact in the open field or at the line of scrimmage. Hyde also has pass protection experience and is an improving receiver. Third day flier: Jeremy Hill, LSU - Hill could offer some of the same attributes as Le’Veon Bell last year. I don’t think he is as nimble or possesses the same receiving skills, but Hill flashes tremendous tackle breaking ability for his high posture and high center of gravity. What is odd is Hill can fall down fairly easily on other occurrences, specifically when contacted at the line of scrimmage. 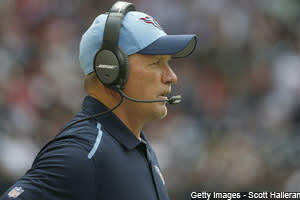 The Titans are installing a 3-4 defense under new coordinator Ray Horton. Kamerion Wimbley, Derrick Morgan, Akeem Ayers, and Shaun Phillips are viable outside linebacker options, with Jurrell Casey and Ropati Pitoitua on the ends. Al Woods and Sammie Lee Hill are possibilities at nose tackle, though Horton prefers space eaters a la Phil Taylor in Cleveland and Dan Williams in Arizona. Horton has historically favored a two-gap scheme. The Titans simply need more talent in their front seven. First day option: Louis Nix, Notre Dame - Horton coached teams have started first-round nose tackles (Dan Williams, Phil Taylor), so Nix could be next on the list. The Notre Dame interior defensive lineman produced flashes of Vince Wilfork in 2012, as he played one or two yards in the backfield, held his single or double teams, and could shed at the line of scrimmage. He is a top 10 talent in my book. Second day possibility: DaQuan Jones, Penn State - I know Jones is frequently projected as a three-technique (next to the guard), but his best attribute could be leverage, hand use, and shedding at the line of scrimmage. That screams anchor defensive tackle for me. He has the lower half to fight against the run and strength to make plays at the line of scrimmage or allow linebackers to run free. Third day flier: Daniel McCullers, Tennessee - McCullers is all frame, no substance. He is a very linear athlete and can get taken down when his balance is off. Still, someone will take a chance on him, and most likely a team that predominantly deploys odd man fronts.